My great grandma Halwas was from Poland, and I remember my grandma making variations of beet and cabbage soup. Although I don't actually have my grandma's original recipe, this is how I like to picture her making it with the fresh ingredients right from the farm. 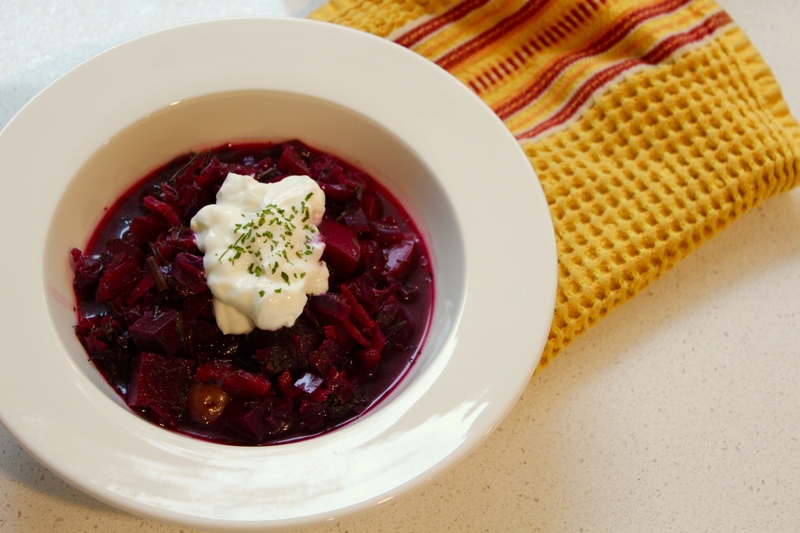 This borscht is packed with antioxidants such as vitamin C and beta carotene, as well as potassium, magnesium, and fibre. Add a little protein with plain Greek yogurt, a few slices of cheese, or a side of hummus and crackers. 1) Heat the oil in a large soup pot and saute the onion, garlic, and carrots a few minutes. 2) Add the beets, potatoes, cabbage, and parsley, sauteeing a few more minutes. 3) Include the vegetable broth, lemon, salt, and pepper. Bring to a boil and then reduce heat to a simmer for 1 hour. 4) Half way throught the cooking time, add your fresh dill and taste the soup, adding more salt as needed.